Did you know? 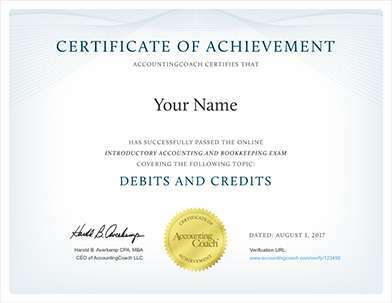 To make the topic of Bank Reconciliation even easier to understand, we created a collection of premium materials called AccountingCoach PRO. Our PRO users get lifetime access to our bank reconciliation visual tutorial, cheat sheet, flashcards, quick tests, quick test with coaching, business forms, and more. When the company receives its bank statement, the company should verify that the amounts on the bank statement are consistent or compatible with the amounts in the company's Cash account in its general ledger and vice versa. This process of confirming the amounts is referred to as reconciling the bank statement, bank statement reconciliation, bank reconciliation, or doing a "bank rec." The benefit of reconciling the bank statement is knowing that the amount of Cash reported by the company (company's books) is consistent with the amount of cash shown in the bank's records. Because most companies write hundreds of checks each month and make many deposits, reconciling the amounts on the company's books with the amounts on the bank statement can be time consuming. The process is complicated because some items appear in the company's Cash account in one month, but appear on the bank statement in a different month. For example, checks written near the end of August are deducted immediately on the company's books, but those checks will likely clear the bank account in early September. Sometimes the bank decreases the company's bank account without informing the company of the amount. For example, a bank service charge might be deducted on the bank statement on August 31, but the company will not learn of the amount until the company receives the bank statement in early September. From these two examples, you can understand why there will likely be a difference in the balance on the bank statement vs. the balance in the Cash account on the company's books. It is also possible (perhaps likely) that neither balance is the true balance. Both balances may need adjustment in order to report the true amount of cash. A helpful rule of thumb is "put it where it isn't." A deposit in transit is on the company's books, but it isn't on the bank statement. Put it where it isn't: as an adjustment to the balance on the bank statement. Recall the helpful tip "put it where it isn't." An outstanding check is on the company's books, but it isn't on the bank statement. Put it where it isn't: as an adjustment to the balance on the bank statement. Bank service charges are fees deducted from the bank statement for the bank's processing of the checking account activity (accepting deposits, posting checks, mailing the bank statement, etc.) Other types of bank service charges include the fee charged when a company overdraws its checking account and the bank fee for processing a stop payment order on a company's check. The bank might deduct these charges or fees on the bank statement without notifying the company. When that occurs the company usually learns of the amounts only after receiving its bank statement. Because the bank service charges have already been deducted on the bank statement, there is no adjustment to the balance per bank. However, the service charges will have to be entered as an adjustment to the company's books. The company's Cash account will need to be decreased by the amount of the service charges. Recall the helpful tip "put it where it isn't." A bank service charge is already listed on the bank statement, but it isn't on the company's books. Put it where it isn't: as an adjustment to the Cash account on the company's books. An NSF check is a check that was not honored by the bank of the person or company writing the check because that account did not have a sufficient balance. As a result, the check is returned without being honored or paid. (NSF is the acronym for not sufficient funds. Often the bank describes the returned check as a return item. Others refer to the NSF check as a "rubber check" because the check "bounced" back from the bank on which it was written.) When the NSF check comes back to the bank in which it was deposited, the bank will decrease the checking account of the company that had deposited the check. The amount charged will be the amount of the check plus a bank fee. Because the NSF check and the related bank fee have already been deducted on the bank statement, there is no need to adjust the balance per the bank. However, if the company has not yet decreased its Cash account balance for the returned check and the bank fee, the company must decrease the balance per books in order to reconcile. Check printing charges occur when a company arranges for its bank to handle the reordering of its checks. The cost of the printed checks will automatically be deducted from the company's checking account. Because the check printing charges have already been deducted on the bank statement, there is no adjustment to the balance per bank. However, the check printing charges need to be an adjustment on the company's books. They will be a deduction to the company's Cash account. Recall the general rule, "put it where it isn't." A check printing charge is on the bank statement, but it isn't on the company's books. Put it where it isn't: as an adjustment to the Cash account on the company's books. Interest earned will appear on the bank statement when a bank gives a company interest on its account balances. The amount is added to the checking account balance and is automatically on the bank statement. Hence there is no need to adjust the balance per the bank statement. However, the amount of interest earned will increase the balance in the company's Cash account on its books. Recall "put it where it isn't." Interest received from the bank is on the bank statement, but it isn't on the company's books. Put it where it isn't: as an adjustment to the Cash account on the company's books. Notes Receivable are assets of a company. When notes come due, the company might ask its bank to collect the notes receivable. For this service the bank will charge a fee. The bank will increase the company's checking account for the amount it collected (principal and interest) and will decrease the account by the collection fee it charges.Since these amounts are already on the bank statement, the company must be certain that the amounts appear on the company's books in its Cash account. Recall the tip "put it where it isn't." The amounts collected by the bank and the bank's fees are on the bank statement, but they are not on the company's books. Put them where they aren't: as adjustments to the Cash account on the company's books. Errors in the company's Cash account result from the company entering an incorrect amount, entering a transaction that does not belong in the account, or omitting a transaction that should be in the account. Since the company made these errors, the correction of the error will be either an increase or a decrease to the balance in the Cash account on the company's books. After adjusting the balance per bank (Step 1) and after adjusting the balance per books (Step 2), the two adjusted amounts should be equal. If they are not equal, you must repeat the process until the balances are identical. The balances should be the true, correct amount of cash as of the date of the bank reconciliation. Journal entries must be prepared for the adjustments to the balance per books (Step 2). Adjustments to increase the cash balance will require a journal entry that debits Cash and credits another account. Adjustments to decrease the cash balance will require a credit to Cash and a debit to another account.